Ah, these are busy days, to be true. The Munchkin has returned to the seat of learning yet I seem to have less, not more time on my hands? Anyway, let all us parents give ourselves a huge pat on the back for having survived the Summer holidays! Did I mention the word "Summer"? Here in the capital, that is how it is feeling this week; better late than never. The skies are decidedly blue, the mercury is rising and the sun is smiling down. What better than to put down my rubber gloves (all I seem to do is clean these days, ah the joys of house renovation), and head out with a few pretty goodies to show you what I've managed to finish. 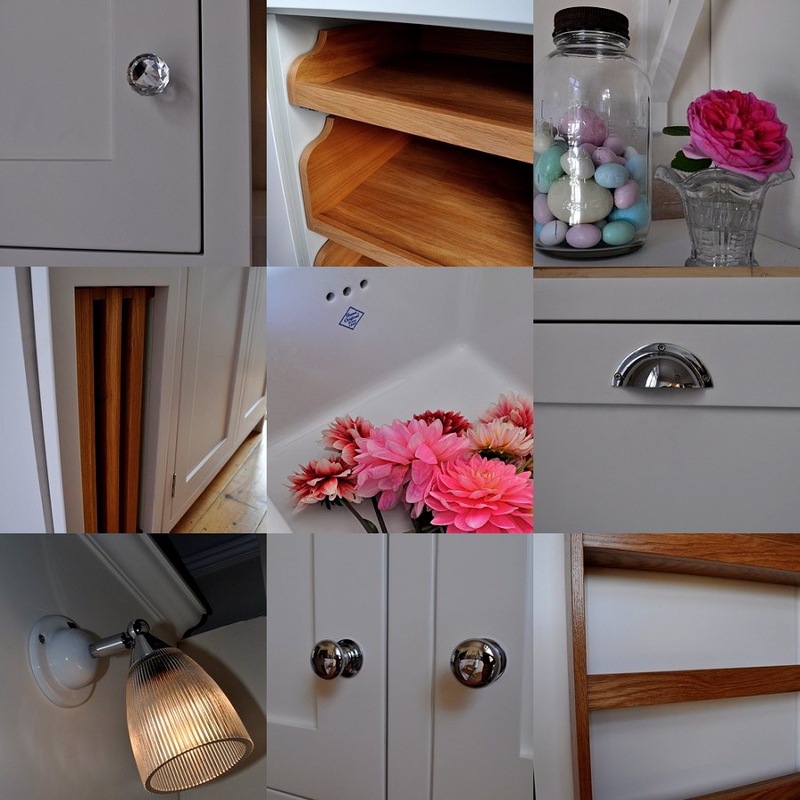 Oh, I do like a finish. Do you remember the strip roll of fabrics I bought from the NEC from Worn and Washed? It took me little time to piece together the top. I added in quite a lot of fabrics of my own and I enjoyed the piecing so much that once I thought the top was complete, I added another four rows, just to make it the size I wanted, you understand. It was good to rummage deep in the stash and see what was squirreled away. Now it is completed, this quilt reminds me of laundry times, with its faded blues and washed out pinks. I bound the quilt with a blue polka dot cotton, I am loving "that blue" at the moment. I settled on the name "The Washday Quilt", it just seemed right. The quilt is backed with a candy striped flannelette sheet, I fortuitously came by a stack of these recently from one of my mum's neighbours. It is old, soft and bobbly. Delicious. I LOVE this quilt. To me, it looks divine but it was also a dream to make, it just went together perfectly. As I hadn't used my beast of a quilting machine for a while, I had a look at the manual and fiddled with the foot pressure setting. Blow me if it didn't quilt perfectly. It fed the quilt sandwich just right so all my lines stayed true, quite important on a brick path quilt with lots of stripey fabrics. It was like a revelation and I was, and indeed remain, thrilled and excited by this find! Just shows, it's always worth re-reading the manual every now and then. Duh. I don't know about you, but now we are in September already (how did that happen? ), there is a decidedly Autumnal feel in the air. The windfalls are dropping, the leaves crispening and the light has a pretty glow. 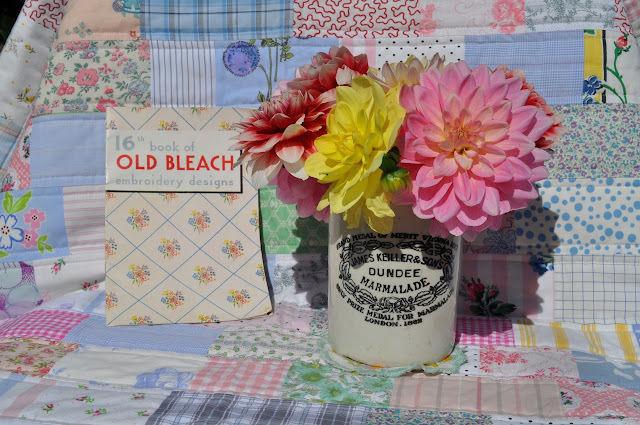 My dahlias, which I grew from some cheap tubers for the first time this year, are flowering splendidly and in honour of The Washday Quilt's moment of glory before the lens, I picked my first bunch for the vase (or marmalade pot, to be precise). The low light through the old apple tree cast a pretty light on the quilt as it lay on the old bench under the spreading branches. In truth, out in the sunshine the colours are a little more vibrant. Oooh, pretty. I feel so very very pleased to be back in the quilting groove and cannot wait to hopefully find plenty of Autumnal and Wintery hours to while away in the Den. Hope you are enjoying happy and productive days, too. 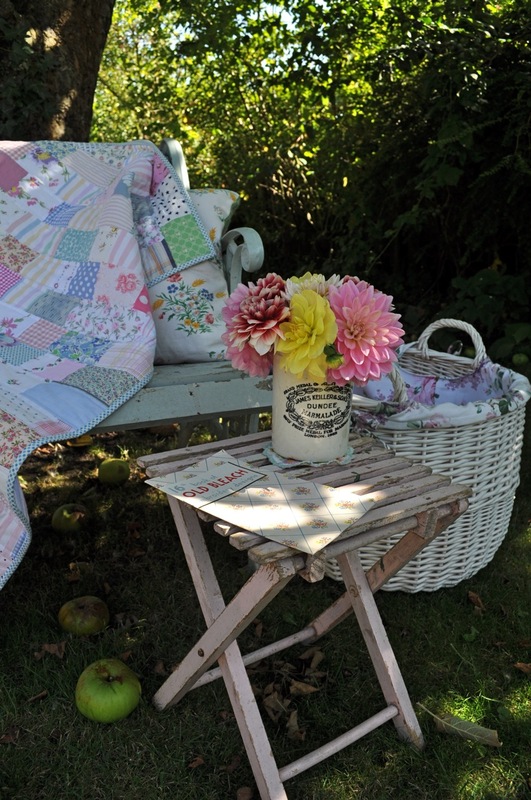 Your washday quilt is absolutely beautiful! The colours are just perfect. Your quilt is so lovely! Perfect for cozying with on a lazy summer afternoon. Very much looking forward to your room reveal. I bet its going to be beautiful! Another fabulous-looking quilt! I cannot wait to see the new kitchen too...you really are keeping evryone waiting! Beautiful quilt. I do so love all of your quilts. Oh your dahlias look lovely. Such big happy blooms. I would be itching to be in that new kitchen too! Love the polka dot binding! I have the exact same marmalade crock that I keep my make- up brushes in. I bought it at a thrift shop over here in the USA. Gorgeous muted colors in this.. just wonderful. I have one single fabulous vintage quilt, made in a star pattern. I got it at an auction years ago. One day I'll have to post it on my blog and show you. I'm rather liking the look of the kitchen too! Beautiful quilt with yummy faded fabrics and I just love the idea of the soft snuggly candy stripe sheet for the backing. Gorgeous flower display and the little vintage book is very sweet too. 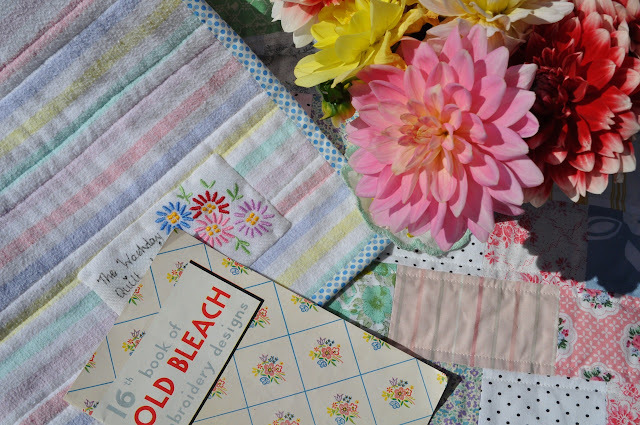 Your Washday quilt is so pretty I love the blue polka dots, yes September already the days are starting to fade..
Well done on the finish! Just love the blue spot binding on your pretty quilt. The dahlias are lovely too especially that pink one. Glad UK is getting some Summer weather...make the most of it. Happy sewing, from Ali. 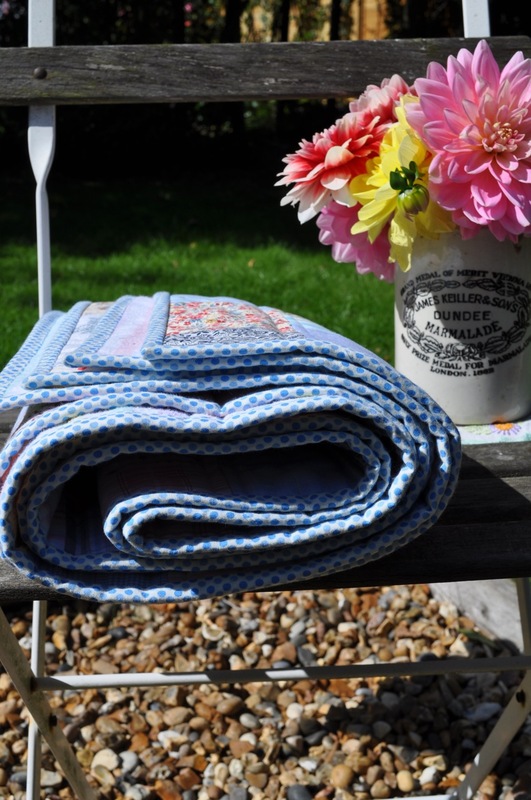 Hen, your washday blue quilt is so pretty, yet another in a series of lovely quilts made By You! You definitely made me laugh with your references to all the information one might gain by reading an instruction booklet. I am just like you...immediate joy at the first use of a new appliance requires a quick first read. I promise myself to take a longer look eventually. Eventually does sometimes turn up! The light through your apple tree created a beautiful photo! Very painterly. Hi Hen..I love 'that blue' too! To me it speaks of summer holidays and tranquility...a colour of my childhood really. I find it easy to sew something when I love the colours too..in fact as much as I want to hold and have the project completed I want more of the journey too. The dahlias are magnificent. Now I really must get mine quilted, you've put me to shame- but it will be hand quilted so s......l......o.......w! I love the look of yours and what a breeze finding that sheet to back it - it looks brill and I bet soft and snuggly. Yep, autumn is here and the temp is dropping, though today the sun shines - let's make the most of it! Lovely quilt! Your blog is delightful! Your quilt is perfectly beautiful, I want to snuggle up in it and the flowers on the label remind me of the embroidered ones on my favourite childhood tablecloth... must quiz Mum on what happened to it! Gorgeous photos and very inspiring. I'm amazed by these photographs! How do you put everything together so well? Please could you make a hotel so we can come and stay! bravo elle est vraiment superbe. 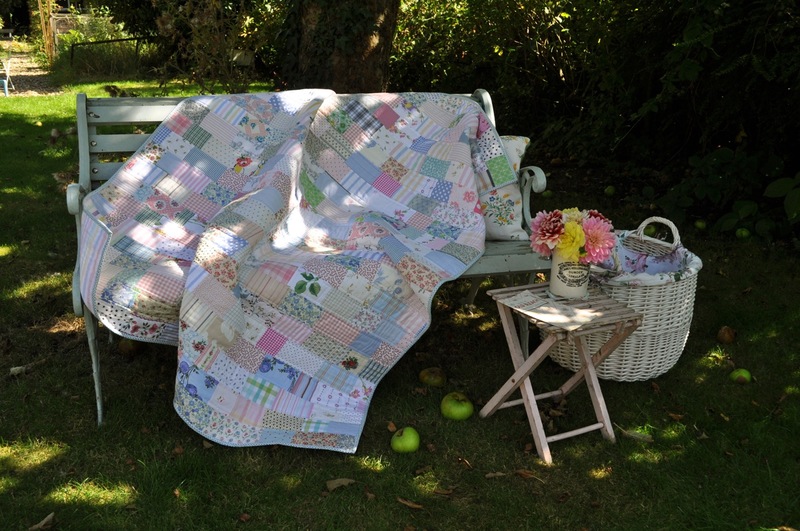 Another beautiful quilt, I hope you enjoy wrapping up with it in the coming colder months. p.s. I have that vintage embroidery book too! I picked it up in a charity shop, I got a whole stack of them :) where did you score your copy?